One of the most spectacular films of 2004 was the epic movie Troy. Spectacular and colorful it certainly was, and featured several excellent actors who gave strong performances. Nevertheless, the film was as much a travesty of history and myth as any other recent swords and sandals movie. Quite apart from the hubris in assuming that one could improve on Homer, the plot was incredibly condensed and simplified, and the departures were for the most part unfortunate and questionable. I was surprised to discover that the script was written by one of the writers of Game of Thrones. I suppose I take little issue with messing with the made-up past, although I wonder if A Song of Ice and Fire fans take similar offense to the adaptation of their beloved books. And, yes, I do realize that the whole story of the Trojan War would have been impossible to fit in a single film (and Homer himself covered only a span of 52 days set in the 9th year of the 10-year war!). But enough about that. 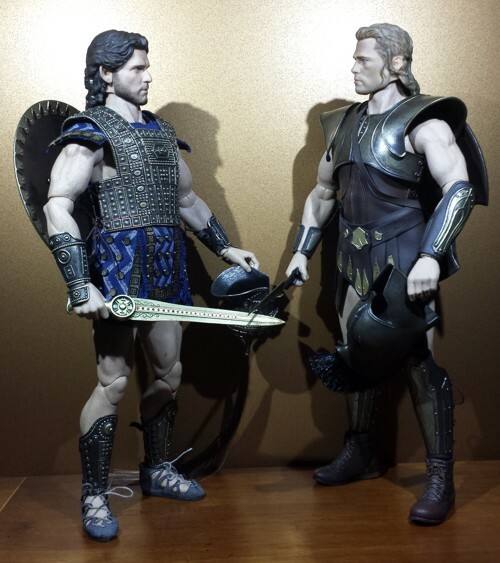 Some years ago Pangaea produced a sixth scale action figure (PG-01) it called "Greek General," based on the appearance of Brad Pitt's Achilles in Troy. In a remarkable commitment to excellence, the company later provided a replacement helmet that improved upon the one included in the initial release. 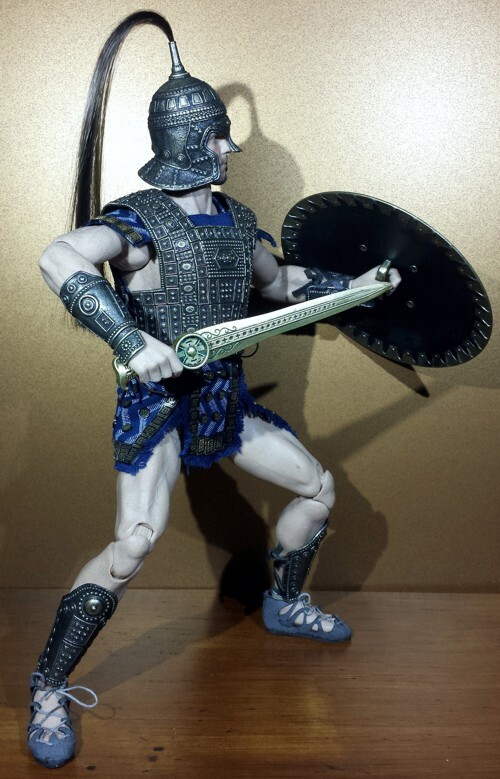 More recently, Pangaea released a companion figure (PG-03), called "Trojan General," corresponding to the look of Eric Bana's Hector from the same film. In some ways, the new product is even more impressive than its predecessor, in others it offers less. But either way, it is an excellent addition to Pangaea's offerings. Besides, from the point of view of modern sentiment, the stoic and empathetic Hector is a more suitable protagonist than the petty and self-centered Achilles. 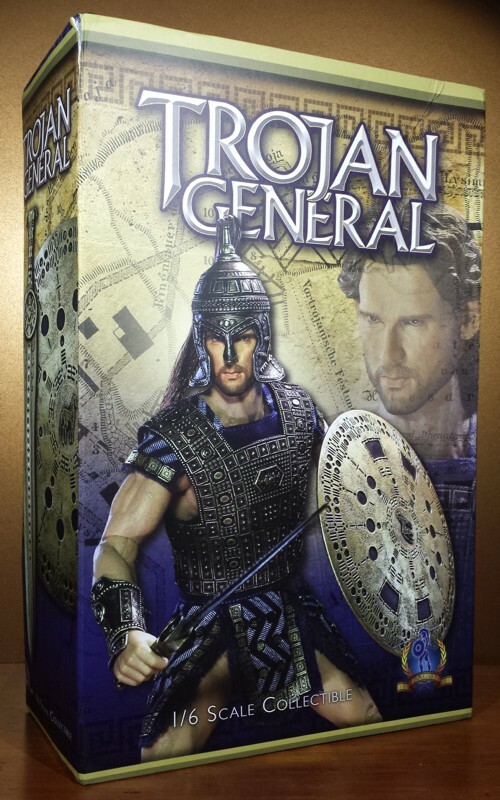 Since the figure is marketed as "Trojan General" rather than "Hector," I supposed this is an unlicensed product and that we should expect a less than perfectly accurate depiction of Eric Bana in that role; nevertheless, it conveys the character -- and the actor -- remarkably well. You can find a few reference images HERE and HERE and HERE and HERE. In keeping with tradition, Pangaea's packaging is spectacular. Not particularly complicated or stunning, but certainly very attractive. It is a standard-sized sixth-scale action figure box, but it opens like a book from the side. Mine came badly damaged from insufficient protective packaging by the seller, but luckily the front and one side were in decent enough shape to take the photo for the review. Except for the top and bottom, the sides feature nice color photos of the figure and its equipment, superimposed upon a suitably tinted German plan of the archaeological excavations of Troy. The back side of the box also lists the figure's features, "cast," and the common choking hazard warning. Once you open the front cover, you are faced by a dark blue expanse, featuring another view of the figure, a naive and slightly poetic snippet about the fall of Troy, and a tinted close-up of Hector's armor. That last part pulls out, giving access to a clear plastic tray (with a clear plastic lid) containing the figure and its accessories. A much smaller clear plastic tray and lid are nestled at the bottom, containing the shield. Everything is safe (considering the beating my box had apparently taken) and collector friendly. This is a difficult category to evaluate. 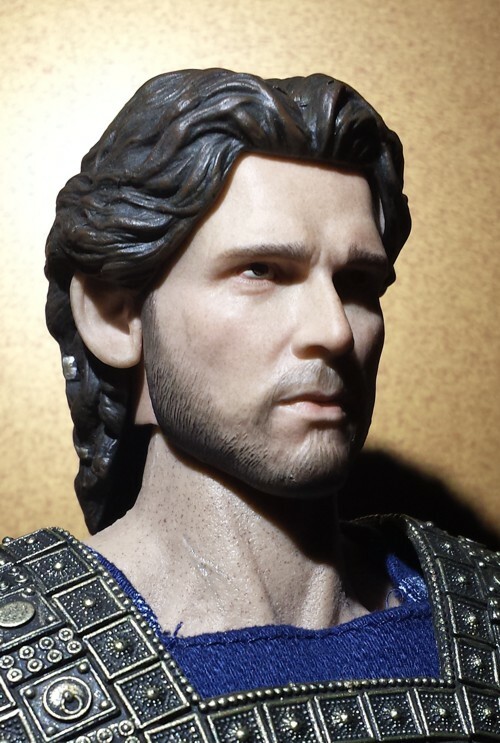 Because this is perhaps an unlicensed product (again, I am assuming this based on the name "Trojan General"), it is possible that the company did not have the right to reproduce Eric Bana's features in the most exquisite detail. If so, then their work is truly remarkable. 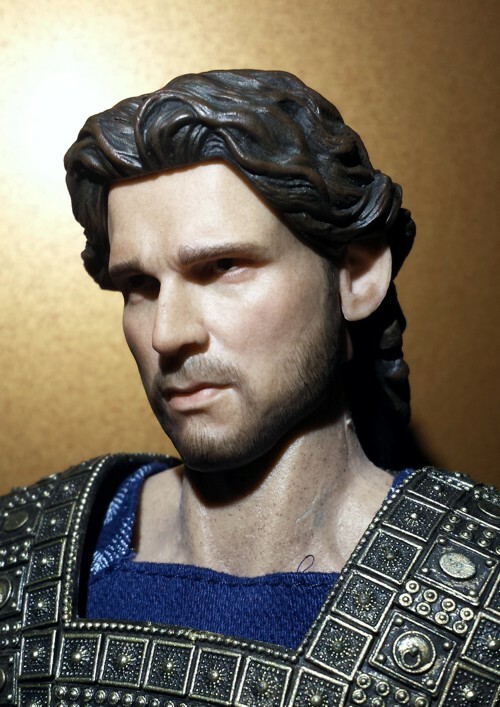 Especially from certain angles and a certain light, this is unmistakably Eric Bana, just as their "Greek General" was unmistakably Brad Pitt. The facial hair is executed pretty well, but overall the hair sculpt lacks the microscopic hair strand detail that we get from, say, Hot Toys. The sculpted hair (together with the ears!) is removable from the head, which allows it to be replaced with the tightly-fitting helmet. The hair fits snugly around the head (helped by a magnet), and its removable character is not overly obvious, though certainly noticeable if you are looking for it. You can always play "can you tell it's a wig?" 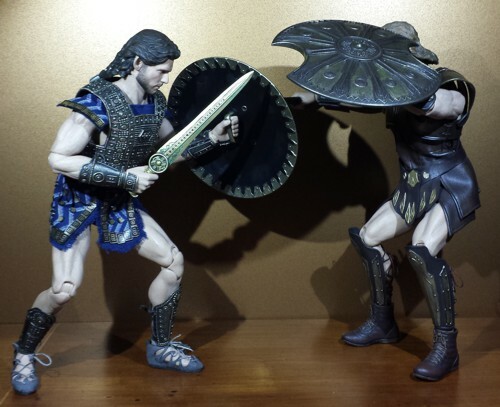 Sculpting also applies to the underlying body, which is actually ACI Toys' "Andrew" muscular body (Pangaea's "Greek General," on the other hand, was ACI Toys' "Bruce" muscular body). These ACI bodies are nicely sculpted, even if the joints are understandably obvious with the exposed elbows and knees. The armor and accessories are also nicely sculpted, but I will discuss them in the outfit and accessories categories. The paint, simple as it is, is executed very well. There is no slop or overflow that I noticed, although for the most part there is little opportunity for such a thing on this particular figure and its outfit and accessories. The paint job on the hair looks a little flat. There is an apparent spot on the left leg just above the knee, but I am assuming this is an idiosyncratic problem with my figure. ACI Toys' "Andrew" is a hard plastic muscle body, and as such it is not capable of the most extreme posability. The elbows, for example, are single jointed. The ankles, on the other hand, have excellent articulation and allow the figure to stand unsupported in a range of poses. The neck articulation is partly limited by the sculpted hair -- if you try to have him look up, the hair would either get in the way or will detach. On the other hand, if you swap the hair with the helmet, the problem largely disappears. The really annoying thing about ACI bodies (at least in my experience) is that the joints -- especially at the shoulders and elbows -- tend to be very stiff. Combined with the relatively brittle nature of the hard plastic, this can lead to snapping at the joints (it has happened to me once in the past). When posing the figure I had to frequently heat up the arms and shoulders with a hair dryer to loosen the joints and avoid breakage. Had this not been a recurrent issue with ACI bodies, I might have given this category an additional half star. The "Trojan General" comes with three additional pairs of hands, making altogether four pairs in all. Of these, fully three pairs are holding hands of slightly different grip (one of the right hands has a pistol grip with the finger extended for a trigger). The remaining pair are relaxed hands. Unusually for sixth scale figures, there is no pair of fists. But all these are more in the way of spare parts than accessories. There is no stand. The accessories proper are a helmet with a dangling crest, a round shield, and a cast metal sword. These are all finished in bronze color, matching both their screen appearance and the figure's exquisite armor. The detail, sculpt, and apparent weathering on the accessories is very good. The close-fitting helmet in particular is the right size and shape, something made possible by the removable hair (and ears). A minor disappointment is the shield's simple handle, which does not allow for a easy or reliable posing in the hand or for suspending it over the figure's back. A bigger disappointment is the absence of Hector's spear, which was as much his attribute as that of Achilles -- and Pangaea's "Greek General" included a nice two-part spear. Did the expense of Hector's more intricate armor necessitate the omission of this accessory? Perhaps. But this is largely why this category lost a star. In this instance, this category comprises armor, footwear, and clothing. 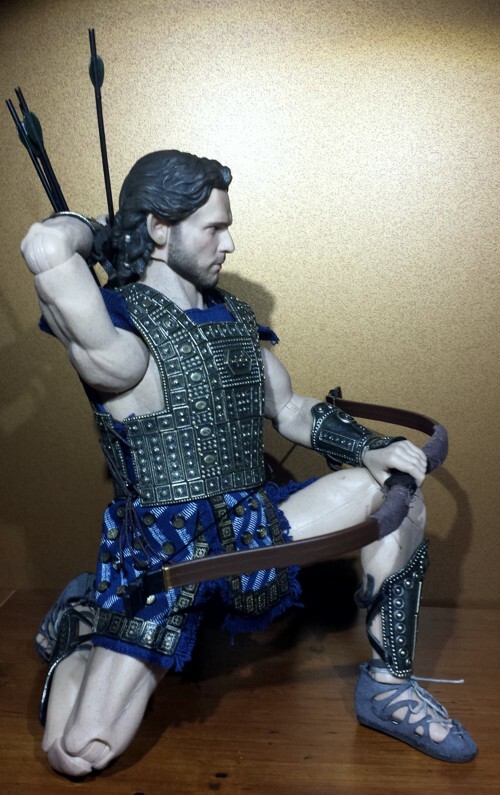 According to the back of the box (I did not undress him to investigate), the clothing consists of three pieces in matching dark blue: underwear ("underpants"), kilt ("skirt") and shirt ("vest"). The kilt and shirt together are probably to be understood as a tunic. It has zigzag patterns in lighter blue or white, and round and rectangular metal-looking studs. The armor is made up of greaves, vambraces ("gauntlets"), and a connected breast- and back-plate, tied on both sides under the arms. 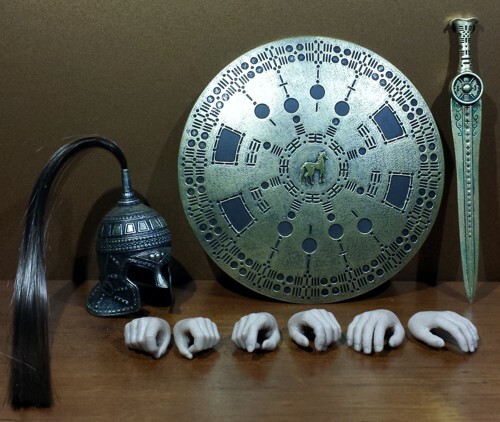 All of these are made of plastic but finished in bronze, making them look metallic and worn. The detail is impressively exquisite and film-accurate. The footwear is a pair of laced sandals made of what feels like soft leather, painted grey. 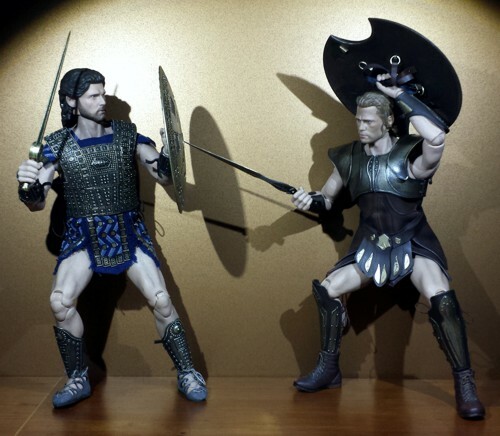 This is not only film accurate, but also more fitting as a choice than the almost modern-combat-boots-looking footware of the "Greek General"/Achilles. Overall, the outfit is probably the category in which this product comes closest to perfection. This is not a franchise like Hot Toys or Sideshow's Star Wars figures, where you would have the potential to assemble a large cast of characters and pose them in a variety of scenes. But the fact that Pangaea had already produced his nemesis, the "Greek General," does increase the potential for fun tremendously, for both figures. While seemingly fairly sturdy, as usual with high end action figures, this is not a toy you want to share with a kid. Pangaea's offerings have never been on the low end of pricing, although the increasingly exorbitant prices of high end action figures have erased some of the disparity. I managed to pick this guy up on eBay for $206 with shipping included from an international seller (and got a mangled box to offset my joy at the savings), but most retailers have him at $230-260, depending on whether shipping is included. There isn't a ton in the way of accessories here and the body is reused from the pre-existing ACI bodies, so I would say this is a middling value. Had the spear been included, I might have given this category another half star. Just one thing, really: those annoying ACI stiff joints that are as likely to result in breakage as actual articulation. The hair dryer is your friend. I really like this figure, despite the occasional shortcomings or limitations identified above. 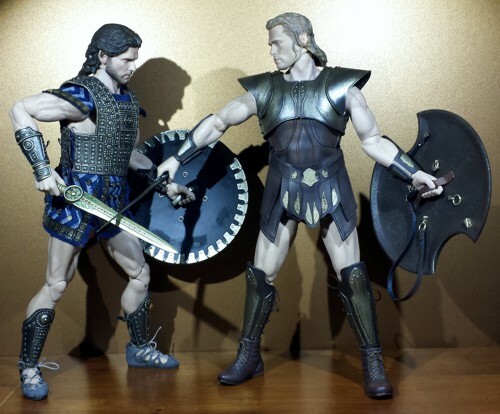 Part of this is because I like the character -- Hector is one of the few truly admirable heroes of the Iliad, and Eric Bana conveyed this as well as he could in the film. The film-accurate and stunningly detailed look of the figure is additional cause for admiration. 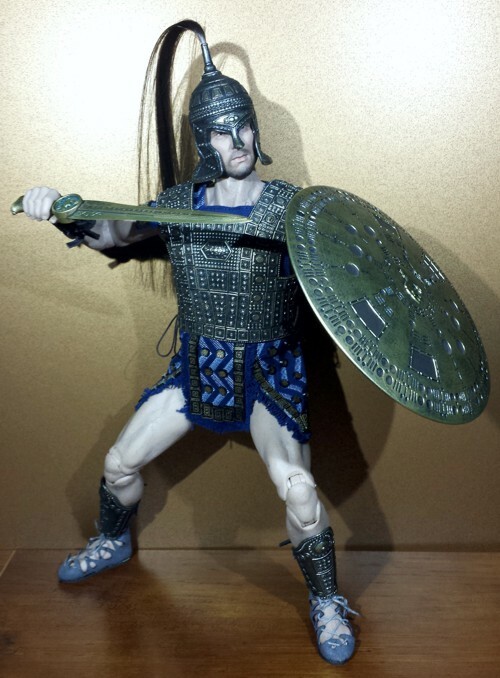 And all this despite this being in essence a fantasy warrior -- although we know a lot of what Bronze-Age Greek warriors would have looked like (Brad Pitt's Achilles was not it! ), we have almost no idea as to how their Trojan opponents would have appeared. None of my usual sponsors are carrying him, but you can search ebay for a deal. 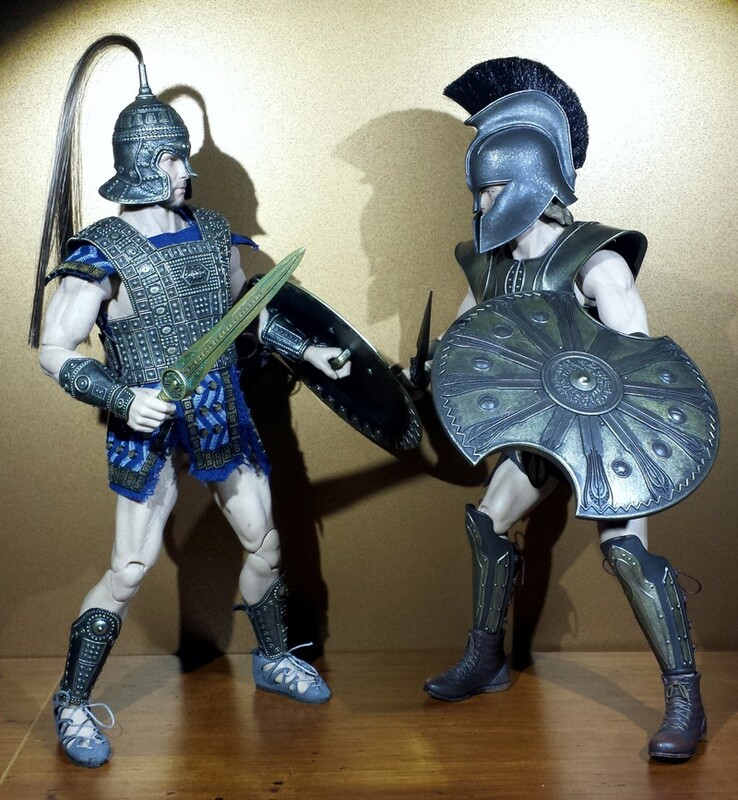 Although the matching "Greek General" and other Pangaea products have not been reviewed here, you can find reviews of at least two other pre-modern sixth scale action figures, Star Ace's Leonidas and Hot Toys' Leonidas.